As demand for high-tech devices grows, so does interest in recycling the esoteric metals that make them run. But challenges abound. April 7, 2014 — Earbuds, touch screens, CFLs with a warm glow, rechargeable batteries and power windows: Most of us take these things for granted. When we do, we also take for granted a group of elements called rare earth metals, whose special electronic and magnetic properties make them a key component of many 21st century technologies. These 17 elements are actually plentiful enough — you probably have some in your backyard — but except for a few ore deposits, they are found in nature in low concentrations that make them difficult to collect. Since they are integral parts of cell phones, hard drives, hybrid cars, wind turbines and other products with skyrocketing demand, rare earth metals face soaring demand, too. 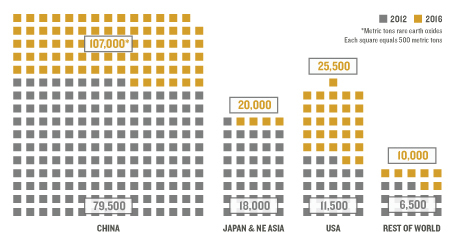 As recently as 2010, China produced about 97 percent of the world’s supply of rare earth elements. That year the country decided to limit exports, which drove prices through the roof. 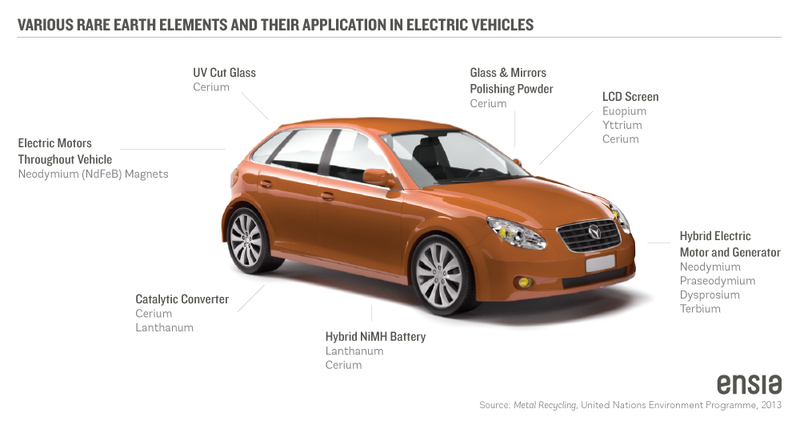 Rare earth metals are a big part of cars and other modern conveniences. Click on the image for details. Source: Metal Recycling, United Nations Environment Programme, 2013. Graphic layout by Todd Reubold. 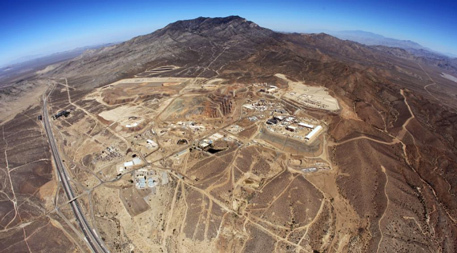 “Prices of some rare earths rose by 2,000 percent and more,” says Jim Sims of rare earth mining company Molycorp, which recently reopened a shuttered rare earth mine in California. Rare earth element prices have since dropped and are now much less volatile — thanks in part to the opening or reopening of Molycorp mines and others around the world. Still, burned by this experience, corporations and countries are working to ensure themselves a sufficient stream of rare earths however they can. One option being explored is recycling rare earth metals from used products. You might think it would be easier to recover rare earths from products than extract them from the ground, but it’s not as easy as it sounds. Given the importance of these products to modern living, governments around the world are funding research to make recycling a more feasible option. Some companies are already finding it worthwhile. Recycling rare earth elements isn’t as easy as recycling glass or plastic — there are challenges at nearly every level. For one thing, the elements are present in small amounts in things like cell phones. As parts get smaller, so do the amounts of material used. In a touch screen, for example, the elements are distributed throughout the material at the molecular scale. Cell phones are typically recycled by smashing, shredding and grinding them into powder. The powder can then be separated into component materials for disposal or recycling. But new cell phones incorporate more elements than ever — some around 65 in total. (For comparison, all of industry uses only about 85 different elements.) This makes the powder a more complicated mixture to separate than it was with older phones. “It’s easier to separate rare earth elements from rocks than from cell phones,” King says. To separate these materials often means “very aggressive solvents or very high temperature molten metal processing. It’s not simple,” says Yale University industrial ecologist Thomas Graedel. Because of the nasty materials or large amounts of energy needed, in some cases recycling could create greater environmental harm than mining for the metals in the first place. 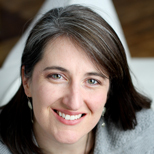 “A case by case analysis is needed to decide whether a given product is a good recycling candidate,” Graedel says. One recent study calculated the complete energy and environmental impacts of producing a kilogram of the rare earth metal neodymium for magnets by recycling computer hard drives versus mining the same amount of virgin material. In the case considered, recycling had a human toxicity score more than 80 percent lower than mining and used almost 60 percent less energy. However, Graedel notes, “this example recovers neodymium in the alloy form used in magnets.” Applications such as use as a glass colorant would require that it be reduced back to elemental form, which would take more resources. The researchers, led by Benjamin Sprecher at the Materials Innovation Institute in Delft, Netherlands, also found that shredding hard drives for recycling resulted in a 90 percent loss of neodymium. “The large losses of material incurred while shredding the material puts serious doubts on the usefulness of this type of recycling as a solution for scarcity,” the researchers wrote. They propose a method in which hard drives are taken apart by hand as a way to address this issue. When small amounts of rare earths are part of complex mixtures, separation can be too expensive to justify for these elements alone, leading some to suggest that the even more valuable elements within electronics, such as gold, palladium and iridium, may make recycling economically worthwhile. “It might be that the rare earths will pay for the price of doing the processing and the gold, platinum and palladium will be the cash flow,” says Eric Peterson of Idaho National Laboratory, who leads the rare earth reuse and recycling research program for the Critical Materials Institute. 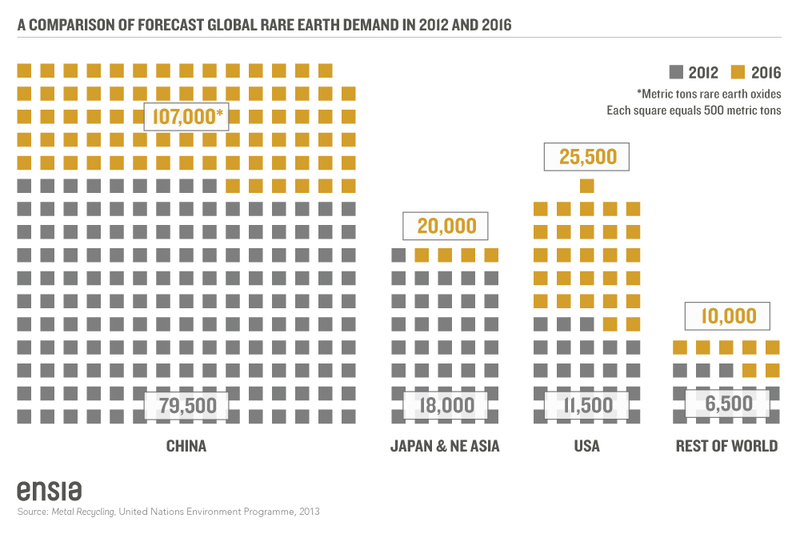 As this comparison of forecast global rare earth demand in 2012 and 2016 depicts, demand for rare earths is growing rapidly around the world. Click on the image for details. Source: Metal Recycling, United Nations Environment Programme, 2013. Graphic layout by Todd Reubold. To address both environmental and economic problems with recycling, the Critical Materials Institute and other research groups, including a European consortium, are testing supercritical carbon dioxide, ionic liquids, electrochemical methods and more as strategies for improving the prospects of rare earth recycling. The existing recycling infrastructure for fluorescent bulbs makes them good candidates for rare earth recycling, many experts say.With price pressures off, at least for now, and few laws requiring recycling, there is little incentive to try to get the materials back. As of 2011, less than 1 percent of rare earths were recycled. People tend to hoard or toss their old phones. Cars, which may have more than two dozen rare-earth-containing motors in them driving everything from windshield wipers to the rear view mirror adjustment, are not recovered formally. Many electronics end up in developing countries where they may ultimately be dismantled in unsafe or inefficient ways. And even fluorescent light bulbs, which are supposed to be recycled by law because of the mercury in the tubes, are only recycled at a rate of around 30 to 35 percent. The existing recycling infrastructure for fluorescent bulbs makes them good candidates for rare earth recycling, many experts say. Fluorescent light bulbs make use of rare earth elements to fill out the color spectrum: the red and green phosphors in the powder that lines the inside of the lights are the rare earth elements europium and terbium. Recyclers collect the mercury, the glass and the metal parts of the bulbs, but they have traditionally dumped the rare-earth-containing white powder that lines the tubes. Some companies are now recovering these. While LED lights may be taking off in popularity, there will be plenty of fluorescent and compact fluorescent bulbs in use for decades to come, Peterson says, so they remain good targets for recycling. LEDs use rare earths, too, but in much smaller amounts than fluorescent bulbs and in ways that make them more difficult to recycle. “I am not convinced that it will be possible to extract rare earths from LEDs in an economical manner,” King notes. Despite the challenges, some companies are trying to make rare earth recycling work.Another promising area for boosting recycling of rare earths is in products that remain concentrated within industries rather than being scattered into the hands of consumers. Cutting-edge wind turbines use rare-earth magnets in their motors; neodymium and dysprosium make super powerful magnets that allow stronger motors and a simpler mechanical design. For offshore wind farms, maintenance is no small feat, so companies tend to install the most reliable option — which contain hundreds of kilograms of rare earth elements. Because they contain such large amounts — and because they are concentrated in stationary wind farms — recycling rare earths from wind turbines is much more feasible than recycling them from products flung far and wide. “There is a much better chance that they have a happy second life,” Graedel says. Despite the challenges, some companies are trying to make rare earth recycling work. French chemical company Rhodia has announced multiple rare earth recycling projects. Mitsubishi Electric reported in 2012 that it is recovering and recycling rare earth magnets from its air conditioners, and Hitachi announced development of a magnet recovery machine for hard disk drives and air conditioners, with the intent to bring the technology into commercial operation. Honda announced last year that it was beginning to recover the rare earth elements from its hybrid car batteries. Design foresight and better planning before products containing rare earths are produced could help recycling become more successful, some experts note. Products could be designed to be easier to dismantle. For example, King says, his team is trying to separate the phosphors from display glass on a phone. “You could ask the manufacturers to come up with a way to get the display glass off at the end of life,” before the phone is crushed. Of course this all assumes a big enough supply of ready-for-recycling electronics — which may not be a safe assumption right now.Another possibility is to isolate the rare earths within a device. “We are working with a couple of electronics manufacturers to understand how you can manufacture a board so you can pluck off certain components off of the board before you take others,” Peterson says. One example might be to build the circuit board in layers, with different materials at different heights so they could be sequentially scraped off. Or modular rare-earth-metal-containing components could be designed to be reused as is, Peterson says. Of course this all assumes a big enough supply of ready-for-recycling electronics — which may not be a safe assumption right now. Wind turbines, for example, have a 20- to 30-year lifetime, meaning almost none is yet ready for recycling. In one recent study, Jelle Rademaker of the Green Academy in the Netherlands and colleagues calculated the potential for rare earth recycling from magnets in computer hard drives, hybrid cars and wind turbines, assuming 100 percent recovery in each case. They found that the amount available for recycling could be at most 10 to 15 percent of the demand between now and 2015. The percentage dips even further toward 2020, as demand takes off but only computer hard drives are available for recycling. “Some people say we should landfill it all and wait for a better technology.” — Jelle RademakerStill, as cars and wind turbines reach the end of their lifetimes, recycling by 2030 could theoretically meet more than 20 percent of demand. “In the long run, it might have a significant impact,” Rademaker notes. Until economics, legislation or demand catches up, one idea is to save the metals, trapped in their devices, for the future. With new recycling strategies being developed and demand for rare earth elements growing every day, it’s possible that moment isn’t too far down the line. Synfuel production based upon renewable electricity and CO2 from seawater is taking of in the near future and will also trigger biomining of brine water from associated fresh water production. Any metal in seawater will be produced including of cause rare earth minerals. Especially Magnesium will be considerably cheaper which will make Aluminum Magnesium alloys mainstream in cars for instance. Ferrous and Non-ferrous metals are accepted by all scrap yards for recycling, but Non-ferrous metals, such as copper, aluminum, brass, stainless steel and bronze, are more valuable than Ferrous metals, like steel and iron.